Glutamate is the major excitatory neurotransmitter at almost all synapses in the vertebrate central nervous system (CNS). Glutamate is packaged into synaptic vesicles in the glutamatergic presynaptic terminals, and released into the synaptic cleft through the fusion of synaptic vesicles to the membrane at the active zone. Once released, glutamate acts on postsynaptic glutamate receptors to regulate several neuronal functions, such as neuronal migration, excitability, plasticity, long-term potentiation (LTP) and long-term depression (LTD). 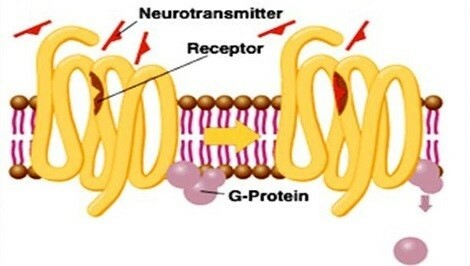 Glutamate receptors are transmembrane proteins, they are numerous and highly complex and can be divided into two main categories: voltage-sensitive ionotropic glutamate receptors (iGluRs), which are glutamate-gated ion channels, and ligand-sensitive metabotropic glutamate receptors (mGluRs), which are glutamate-activated G protein-coupled receptors (GPCRs). Acting as cation channels that open upon glutamate binding, postsynaptic iGluRs mediate the fast excitatory transmission. IGluRs can be further categorized into N-methyl-d-aspartate (NMDA) receptors, α-amino-3-hydroxy-5-methylisoxazole-4-propionic acid (AMPA) receptors and Kainate (KA) receptors. AMPA receptors are the first target of glutamate released from presynaptic terminals, leading to post-synaptic membrane depolarization through the influx of sodium, and therefore play a fundamental role in synapse maturation and plasticity. In addition, AMPA receptors can be regulated by auxiliary proteins that participate in trafficking, such as TAPC1. AMPA receptors are heterotetramers formed by tow dimers with different combinations of the four AMPARs subunits GluA1-4, and usually GluA1/GluA2 and GluA2/GluA3 in mammalian CNS. When GluA2 is lacking in the tetramer, AMPA receptors allow low permeability to calcium ions. Following the initial AMPAR-mediated depolarization, NMDA receptors are permeable to sodium and calcium ions to mediate excitatory transmission upon glutamate binding. 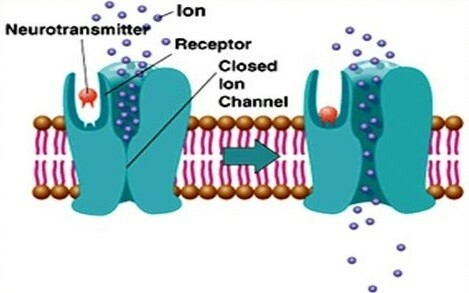 Specially, NMDA receptor is a coincidence detector, the open of the channel requires the postsynaptic cell to be depolarized to remove the physical occlusion by magnesium when glutamate is binding to the receptor. NMDARs are heterotetramers, which exist two GluN1 subunits and two GluN2A or GluN2B subunits. The switch between GluN2A and GluN2B subunits plays a crucial role in modulating receptor function. Kainate receptors also mediate a postsynaptic current through the entry of sodium and calcium (a smaller extent), resulting in a smaller contribution to neuron depolarization than AMPA receptors. They are also heterotetramers, which are composed of KA1, KA2, GluR5, GluR6 and GluR7. Generally, AMPA receptors mediate fast (< 10 ms) synaptic transmission, while NMDA and Kainate receptors mediate slower (10-100 ms) synaptic transmission. In addition, glutamate can act on mGluRs to modulate neuronal excitability and synaptic transmission. MGluRs are slower acting as they exert their effects indirectly through recruitment of second messenger systems, involving the process of gene expression and protein synthesis. Acting as GPCRs, mGluRs are assembled in dimers, which exist eight mGluR subtypes (mGluR1-8) that are differentially expressed in specific neuronal populations in the CNS. And they are divided into three subgroups based on sequence homology, G protein-coupling, and ligand selectivity. Group I mGluRs (mGluR1 and 5) are largely expressed on the postsynaptic membrane, and are mainly associated with Gq/Gs. Upon binding of glutamate, Group I mGluRs trigger the activation of phospholipase C (PLC), resulting in the generation of inositol IP3 and the hydrolysis of phosphoinositides, which leads to the calcium mobilization from endoplasmic reticulum and protein kinase C (PKC) activation. This signaling pathway is responsible for increased neuronal excitability. Group II mGluRs (mGluR2 and 3) and Group III (mGluR4, 6, 7, and 8) are situated not only postsynaptically, but also presynaptically where they function to suppress excess glutamate transmission. After its action on Group II and III mGluRs receptors, glutamate can be transferred from the synaptic cleft by EAATs expressed either on the presynaptic terminal or neighboring glial cells. In glial cells, glutamate is converted to glutamine, which is then transported back to the presynaptic terminal and converted back to glutamate. Glutamate receptors are located in both neurons and glial cells throughout the CNS. The glutamatergic synapse pathways, which are linked to many other neurotransmitter pathways, play a crucial role in a large array of normal physiological functions. The glutamate dysfunction stands out as a key factor in both neurodevelopmental diseases and injury. 1. Moretto E, Murru L, Martano G, et al. Glutamatergic synapses in neurodevelopmental disorders[J]. Progress in Neuro-Psychopharmacology and Biological Psychiatry, 2017. 2. Glutamate-related biomarkers in drug development for disorders of the nervous system: Workshop summary[M]. National Academies Press, 2011. 3. Korte M, Schmitz D. Cellular and system biology of memory: timing, molecules, and beyond[J]. Physiological reviews, 2016, 96(2): 647-693.